Dewatering of the paper sheet on a conventional tissue machine is normally accomplished by using a combination of mechanical and thermal processes. Following formation of the sheet, the dry solids content is initially increased to around 40-45% by pressing and vacuum forces. This is followed by evaporation in the Yankee and hood to 93-95% dryness. The evaporation phase is by far the most energy-intensive process in tissue making. This article will discuss several key factors which influence evaporation and, when optimized, can help achieve the best overall energy and cost efficiency for drying in conventional tissue machines. Total steam consumption to Yankee: 600-700 kWh/ton. “Average” total energy demand is therefore around 2,000-2,300 kWh/ton or sometimes below. If the machine is using recycled paper as its raw material, these figures will be higher. As the figures above show, more than 60% of the total energy consumed for producing the conventional tissue sheet is used for evaporative drying in the Yankee and hood. Obviously, the share of this thermal energy consumed in the hood versus that used in the dryer depends on the chosen balance being applied between the two pieces of equipment. With such a large share of total energy going into drying, and energy prices fluctuating widely, it’s no surprise that mills are doing everything they can to lower their overall energy consumption, with an eye on the drying process in particular. In mathematical terms, the drying evaporation energy required by the Yankee and hood to reach a certain % solids content is directly dependent on after-press dryness coming in. It can be described as shown in the following equation, with the most important factor in this equation being the variable E: Dryness at the hood inlet, meaning the percentage of solids as the sheet enters the hood. In reality, the Yankee dryer and the hood (Fig. 1) are inseparably intertwined pieces of equipment. 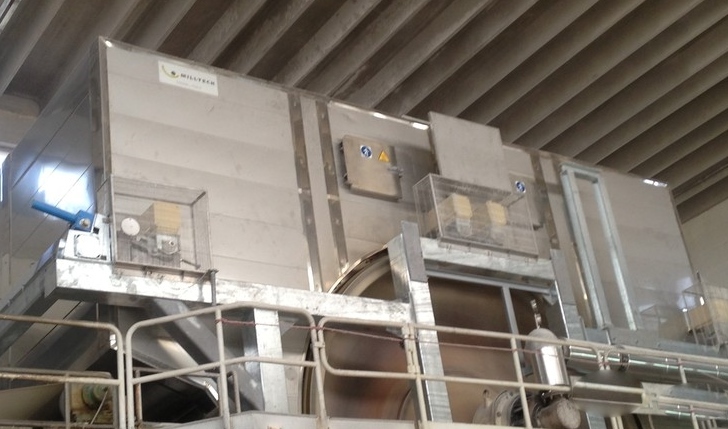 But there are many different ways in which the tissue mill can optimize them for best energy efficiency, depending on the specific circumstances and location. Although the Yankee and hood are closely intertwined, their impact on drying costs can be very different. In general, drying done by the hood requires up to 30% more energy, per kg of water evaporated, compared to drying on the Yankee. Therefore, it is usually beneficial from an energy standpoint to maximize drying by the Yankee, possibly by considering a larger diameter unit, and then running the hood according to production priorities and local conditions, especially in terms of available energy sources. Once the choice of Yankee dryer is made for a machine, it is the hood which completes the picture in the drying section. The choice of hood system design, however, is not straightforward since there are many options to consider. Local energy availability and individual production requirements are the most critical parameters when specifying the hood, and these options need to be well understood to get the best energy and cost efficiency. With choices ranging from a simple suction hood to a gas-heated unit, the best solution will vary from mill to mill. Gas is clearly the most effective fuel for drying, but in some cases steam is the only available source of heat. Gas hoods today are also far less challenging than in the past, and the benefits in terms of flexibility, capacity and overall efficiency make them an attractive proposition. In addition, it is important to note that it is easier to keep the hood system clear of fiber build up with gas than with steam. No matter what industry we may be talking about, heat recovery plays a vital role in overall energy efficiency of any operation. The goal for all tissue making operations should be to let no energy go to waste and, specifically, to realize that it makes no economic or environmental sense to simply let exhaust heat from the hood be released to the atmosphere. 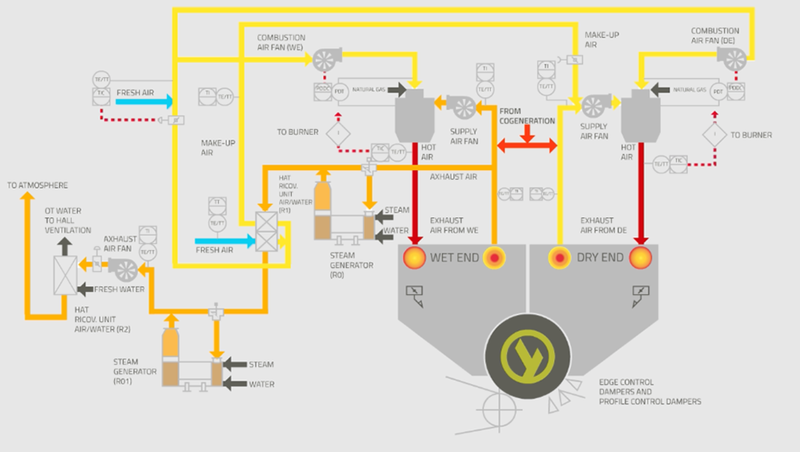 Heat recovery should therefore be the starting point in planning any new tissue machine or rebuild. The stages involved can be broken down into four main categories: R0, R1, R2 and R3. Establishing at the outset of a project which of these categories apply to the mill in question helps to focus the heat recovery strategy. The specific solution applied will depend on process design, local heat sources, environmental rules, and on level of investment cost allowed. 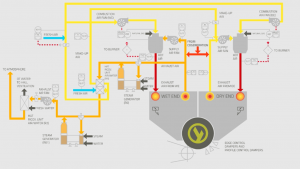 R0 heat recovery, which is only applicable to a gas hood. In this case, the exhaust air from the hood is used to generate fresh steam, via a recovery boiler, which feeds the Yankee. This solution has to be designed with great care according to the hood specific working conditions and hot air system balance. The recovered steam can represent a significant direct use of the hood gas energy which can be returned back to the Yankee in a short loop. R1, representing air-to-air heat exchange within the hood system by which heated exhaust air is used to pre-heat incoming fresh air, before it is exhausted either to the atmosphere or to the following hear recovery stage. R1 is the main form of heat recovery used when working with a steam-heated hood. R2 and R3, which are both typically applicable to gas-heated hoods. R2 is normally based on an air-to-water heat exchange which contributes to hall heating and ventilation systems within the mill. This provides a way of heating buildings through recovered exhaust heat, although it is climate and season dependent. R3 heat recovery involves the installation of a heat exchanger that is used to heat process water, delivering several benefits. For example, it can increase temperature in the dilution water, machine showers, or approach flow circuit. This, in turn, can improve the machine’s performance because of better drainage due to lower viscosity, and higher drying efficiency due to the increased temperature. In addition, maintaining a steady process water temperature can also improve the final sheet formation. These four heat recovery categories, R0-R3, give a broad overview of the possibilities for heat recovery in tissue production. But the difference between ‘good’ and ‘excellent’ energy performance is all about stability and balance. It sometimes may be possible to increase overall energy efficiency by several percentage points, simply by using the right strategy in process balancing. Strategies to achieve this include optimizing the balance between Yankee and hood drying, and within the hood, between the contribution of the wet and the dry end sections in the hood. Stability of the process is another essential factor for optimization. As an example: achieving uniformity of dryness, with reduced peak-to-peak dryness variation in the sheet, allows the system to be set for higher drying capacity and higher process stability. One solution which has been applied is the gas or steam “hybrid” hood, in which the degree of heating contributed by the hood, and in different sections of the hood, can be easily varied, from zero (suction only) upwards. Typically, a hood will blow steam or gas-generated hot air in the wet end, while in the dry end, the hood’s role is limited to suction. This is a good solution when energy reduction is a priority, as it offers reasonable drying capacity, especially in combination with proper heat recovery systems. In fact, for the reasons mentioned, the best solution in terms of total energy efficiency is to dry the sheet with the Yankee alone – with the hood just providing suction. But this is not always realistic for meeting production goals, so to achieve the mill’s needs both for energy efficiency and output volumes, a hybrid solution sometimes can be ideal. Finally, the steam hood can also use heat recovered in the form of condensate from the Yankee, just as the hood’s exhaust air can heat incoming air, to keep efficiency at a high level. The ideal balance between Yankee and hood will depend on the grade of tissue in question in terms of drying capacity. For low basis-weight products such as toilet paper and facial tissue, the “wet-end-only” heating concept is generally fine. In this case the dry end of the hood merely acts as an exhaust system, just keeping the air temperature high enough to avoid water droplets forming inside the hood. You can even use this set up for heavier grades, if you are prepared to sacrifice some speed. There are many other factors which may affect efficiency in drying, but they are beyond the scope of this document to cover in detail. In general terms they include items such as hood cross-nozzle box design, the operating distance from the hood to the Yankee surface, hood frame stability at high temperatures and other issues. Continuous R&D developments are being evaluated in this regard to achieve better machine performance. Consider the possibility to implement specific software for automatic optimization/combination of main operating parameters of Yankee/hood.